The school-wide resources are broken up into the categories below. Please visit the appropriate category link to find the resource you are seeking. If you cannot find a particular item, feel free to contact us. Program Development and Evaluation Tools This link is to a page with information and resources aimed at facilitating Program Development and Evaluation, including DASNPBS, DDRT, School Climate, and team meeting resources. Prevention: Developing SW and Classroom Systems Tools This link is to a page with information and resources facilitating Prevention. It includes expectations, teaching, rewards, and positive relationships resources. Correcting Problem Behavior Tools This link is to a page with information and resources targeted at developing strategies for Correcting Problem Behavior. It includes referral system, major vs. minor behaviors, defining problem behaviors, problem behaviors procedures, managing behavior, and disciplinary encounters and problem solving resources. Developing Self-Discipline Tools This link is to a page with information and resources created to facilitate Developing Self-Discipline. It includes positive relationships, social-emotional learning (SEL), service learning, student leadership, praise and acknowledgement, and preventing bullying resources. Bullying Tools This link is to a page with information on bullying by school level and with links to several evidence-based bully prevention programs. Understanding DE-PBS Acronyms This document provides a list of commonly used acronyms and their meanings. Tier 1 Presentations and Schedule This page provides a description of various trainings and access to resources provided at the trainings. Key Feature Status Tracker This word document provides a method of both evaluating the presence of key components and creating an action plan based on that evaluation. 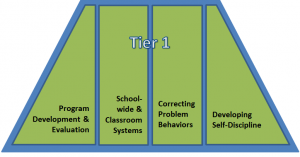 The Status Tracker assesses four areas: Program Development and Evaluation, Prevention: Implementing Schoolwide and Classroom Systems, Correcting Problem Behavior, and Developing Self-Discipline. Key Feature Status Tracker Template 1 Year This excel file graphs the results of the Status Tracker by section. Key Feature Status Tracker Template 2 Year This excel file graphs the results of the Status Tracker by section and allows for comparison across years. DE-PBS Overview Presentation This powerpoint provides a template for schools to use for both introducing and review key components of PBS.